Bonner-Prendergast's Tariq Ingraham blocks the shot of Lower Moreland's Demosthenis Amanatidis during the 2nd quarter of the PIAA Class 4A semi-finals state playoffs in Plymouth Meeting, Pa., Monday, March 18, 2019. Bonner-Prendergast beat Lower Moreland, 83-47, to advance to the State Championship game. When you wear a size-16 shoe, generally speaking, you step wherever you would like. 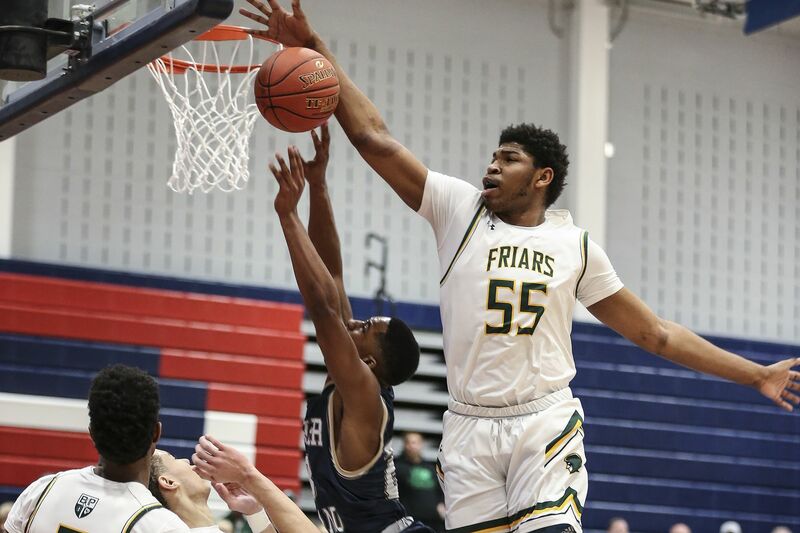 On Monday night, however, 6-foot-9, 240-pound Bonner-Prendergast senior Tariq Ingraham had to be careful where he put his pups against Lower Moreland. Considering his opponent didn’t have a player taller than 6-foot-2, Ingraham had to be especially careful. Disparities in size can sometimes become the mating call of the referee’s whistle. Instead, Ingraham stayed composed and helped the Friars explode in the third quarter, walloping the Lions, 83-47. Stingy defense helped the Friars pull away in the decisive third quarter, when they outscored the Lions 31-7. Offensively, Ingraham, who is considering an offer from Wake Forest, finally ditched the finesse and hammered home two dunks in the third. He finished with 14 points, 10 of which came in the decisive third quarter. He also grabbed seven rebounds and didn’t need to play much in the fourth. He won’t have that luxury when the Friars play Imhotep in the PIAA Class 4A championship Thursday at the Giant Center in Hershey. Imhotep smoked Hickory, 65-46, in Williamsport. The Friars beat the Panthers, 59-57, in overtime on March 1 to claim the District 12 crown. On Monday, the Friars’ defense forced 13 turnovers, blocked four shots and added six steals. Sophomore Malik Edwards led the Friars with 15 points off the bench. Isaiah Wong added 10 points, eight rebounds, three assists and blocked two shots. Junior guard Donovan Rodriguez, a defensive catalyst, added nine points and six assists. The Lions were led by 15 points by Jake Himmelstein. Shane Cohen added 13. Lower Moreland, however, shot just 17-of-47 from the field, 5-of-18 from three-point range and 8-of -7 from the foul line. The Lions also gave up 11 offensive rebounds. BP: Isaiah Wong 10, Tyreese Watson 7, Tariq Ingraham 14, Mike Perretta 14, Donovan Rodriguez 9, Malik Edwards 15, Chris Haynes 4, James Welde 2, Cobe Ruley 2, Christion Johnson 2, Conor Eagan 2. LM: Joey Cerruti 5, Shane Cohen 13, Jake Himmelstein 15, Jordan Zoubroulis 6, Forrest Keys 6.